A dramatic wedding photo of the groom dipping the bride during their First Dance at the reception. 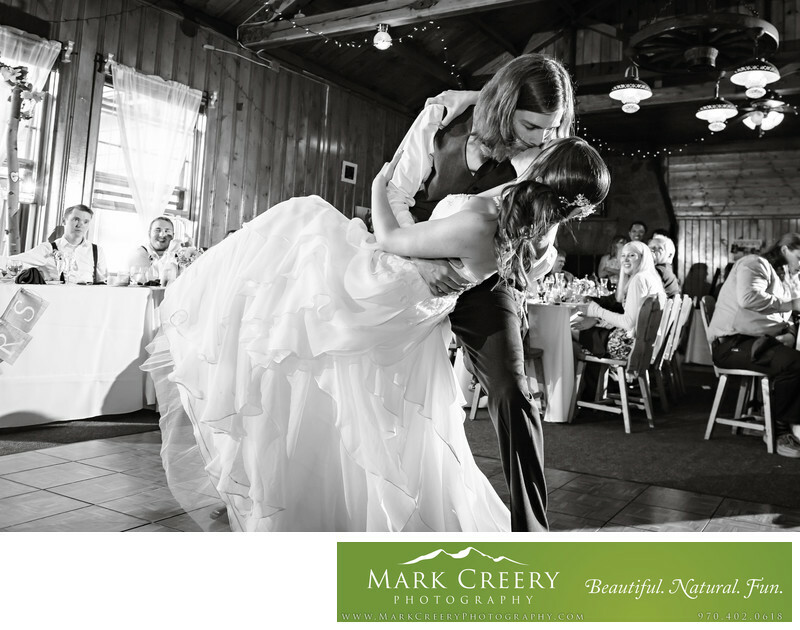 I am always looking to capture the fun interactions of the First Dance. Sometimes the dances are choreographed and involve some playful moves. Sometime the moves are completely spontaneous. These dances keep me guessing, so I'm never complacent when watching them and always have my camera ready for something like this dip. I have to be in the right place at the right time. The Briarwood Inn provides a scenic setting for wedding photography. The location matches the relaxed vibe I try to create in my style. Their new ceremony location at the Garden Terrace is an elegant addition to the venue, with a water feature, stone work, pergola, lawn and gardens. There are two dining rooms to choose from for your reception - the Grand West Dining Room for up to 120 guests, and the East Dining room for up to 75 people. You can't go wrong with either. The Briarwood Inn is located in Golden, Colorado. Contact: Duncan Newman, (303) 279-3121, duncan@thebriarwoodinn.com. Location: 1630 8th St, Golden, CO 80401.